The new 2Xperience Acryl from Pro-Ject follows on from the original 2Xperience model but now with an improved DC motor and power supply. The precision DC motor and power supply helps maintain the optimal speed of your turntable thanks to the implemented electronic speed control. The acoustically inert turntable chassis is made from 1 piece of transparent acrylic so not only does the 2Xperience boast a minimalistic and stunning look it also aids in delivering superior vinyl playback. 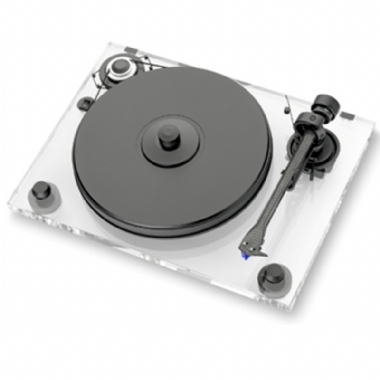 Placed on top of the acrylic chassis is Pro-Ject's own precision balanced sandwich platter topped with vinyl. When used with the supplied record clamp your records have the perfect surface to sit and play. The 2Xperience Acryl comes pre-fitted with the highly regarded Pro-Ject 9CC Evolution Carbon Fibre tonearm and an Ortofon 2M Silver cartridge to round of this incredible turntable package.